The Poem Farm: I Am the New Kid - and a New Book Too! I Am the New Kid - and a New Book Too! 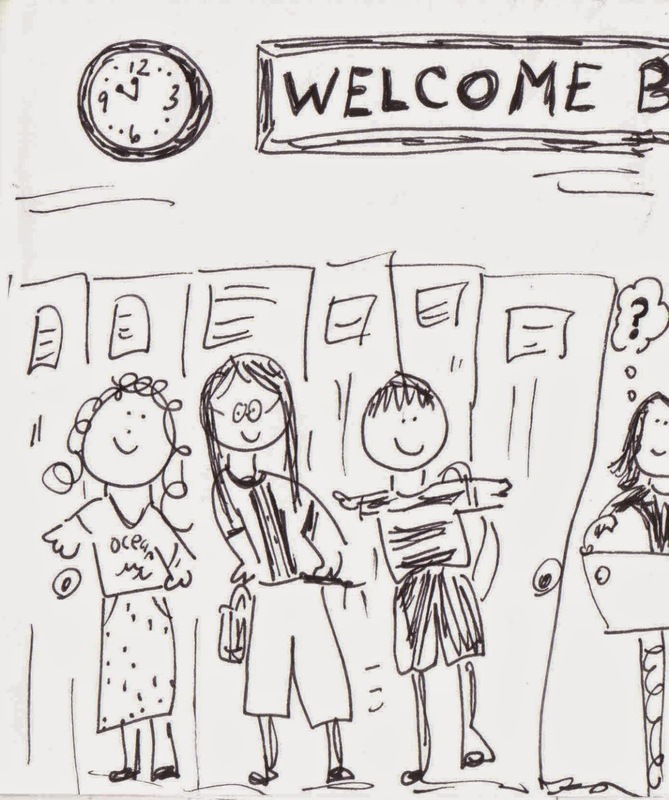 Students - I have been the new kid, each of our children has been the new kid, my friend Rosie is the new kid this year, and well...here at the start of school, I am just thinking about that feeling of being new. When I was the new kid (a few times as I went to three elementary schools and then studied as an exchange student after high school), I especially remember not knowing where to look. Other people were laughing and talking, but not me. Where should I look? Each time, that new-kid-feeling went away in time, but during that new-kid-time, I was uncomfortable. This poem is to honor all of the new kids in new classrooms this year. And it is also to remind all of us not-new-kids to reach out, say hello, be a welcoming force in this world. When you sit down to write today, you might try to remember a feeling you once had. It may be a feeling you have not had in a while, but you remember it clearly. You might even think of someone you know who has been having a big feeling lately, try to imagine how that person feels. Close your eyes and feel a feeling. Then, maybe, try writing in that feeling-voice. See if you can call it back with your words. at the beginning and the ending of the poem. Sometimes using such a circular structure, or ending where you began, can be a great way to help a poem hold together. And now...a new book on the scene! There is a legend that describes how, at midnight on Christmas Eve, all creatures are granted the power of speech for one hour. In this rich collection, Lee Bennett Hopkins and a dozen other poets imagine what responses they might offer. 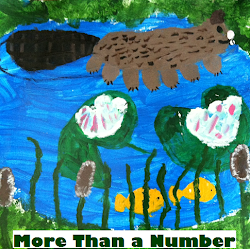 The poems represent a diverse group of animals, but all come together with one singular purpose: celebrating the joy of the miraculous event. This collection of graceful poems provides readers with a Nativity story unlike any other -- at times gently humorous, at times profound, but always inviting readers to appreciate the wonder of Christmas. This book is a perfect gift for the holiday season. 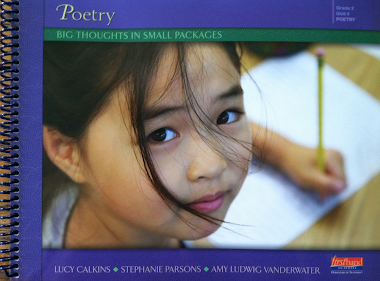 I am honored to have written the sheep poem for this book. When Lee asked me to do so, it felt completely right as we then had a flock of sheep living in our yard. Here is the poem I wrote from a sheep's point of view. 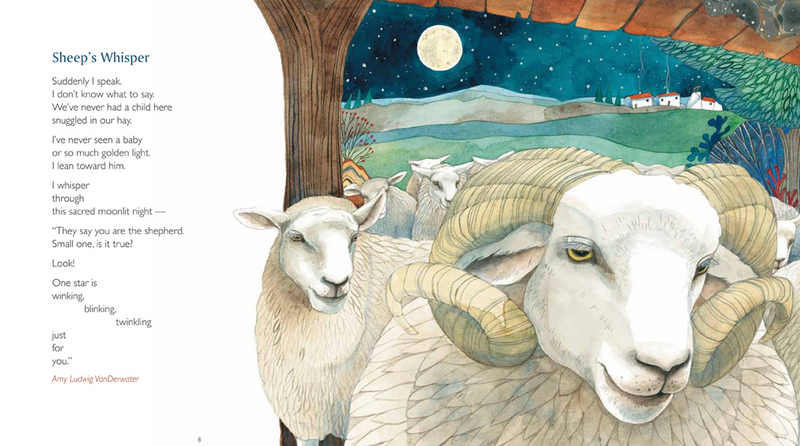 Much later, when Lee shared the gorgeous and tender illustrations by Helen Cann, I was astounded by how the sheep Helen imagined for Lee's book looked exactly like our oldest and most loving ram, ReRa, the first ram of our flock, now gone after a long life. Of course Helen and I never communicated about this sheep, yet perhaps - magically - we did. 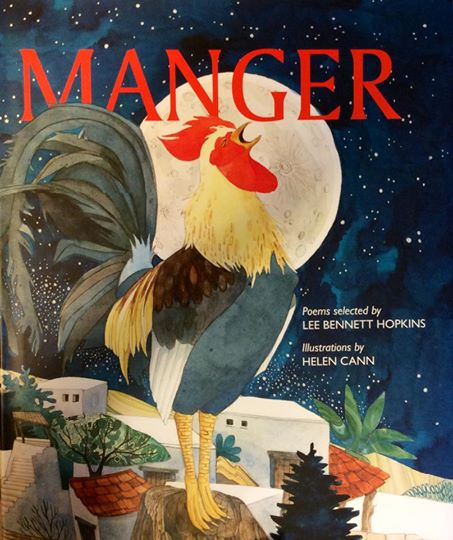 MANGER is on my Christmas list as a book to give this year, and I highly recommend it for all who love books about Christmas, animals, poetry, and love. 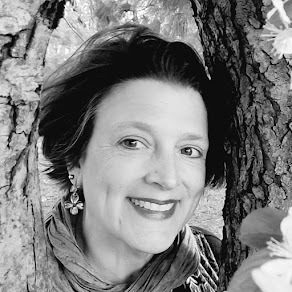 Laura Shovan is hosting this week's Poetry Friday party over at Author Amok. There you will find a delicious buffet of blogs to visit...all celebrating poetry! Being the new kid is hard. Love the ending of your poem. And your sheep poem is gorgeous! Can't wait to see this new LBH masterpiece! 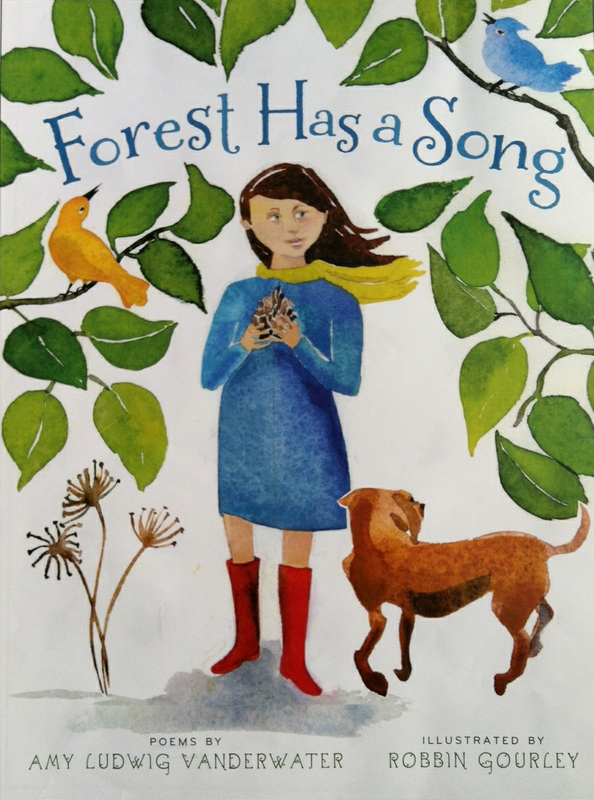 So many of us can identify with your poem, Amy - nicely done. And I can't wait to see all the other poems in the book, if they're as good as yours! Amy, thanks for this poem about the new kid. I hope students everywhere will be encouraged to reach out by your words..."Will you?" And I'm so excited about Manger. I hope my indie bookstore has it. The illustration for your poem is gorgeous! What a striking similarity with your ReRA! I looked at the ReRa doppelganger Helen Cann beautifully created that magical way. I agree with you. poem which captures that tenative feeling so well. first time with new pals adventures of a sea monster, a dog & a teacher whose students bring her strange gifts. 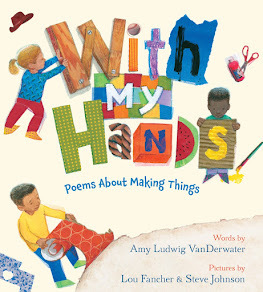 Great poem, and the new book sounds wonderful! I'm a huge fan of Nativity stories. Though school has started, I think teachers will still appreciate your poem, Amy. It's such a brave thing to walk in and not know anyone. You've shown that feeling beautifully. My granddaughter started at my school this year, and it was a challenge to move from her old pre-school to everything new. I have the book Manger bookmarked. 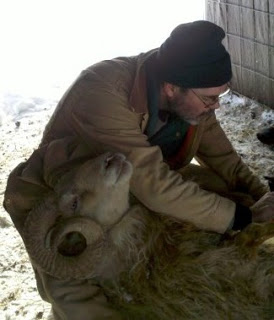 What wonderful serendipity that the sheep reminds you of your own ReRa. Those things give me shivers! Terrific poem, Amy - I know many will appreciate! The expression on ReRa's face in the photo looks blissful. Did he like getting his hooves trimmed? The illustration for your poem is gorgeous!! I know that "not sure just what I should say or who I should talk to" feeling -- we've all been there! Thanks for this poem from all the new kids! I try my best to help the "new kid" phase pass as quickly as possible for those who come to my classroom door. This is a good poem to remind those of us who never experienced it first hand how it feels. Wow! That illustration and your ReRa do look alike. Beautiful poem, Amy. Congrats on the book. I actually like being the new kid every once in awhile. It's scary, but fun, to meet new people and learn a new place. Into cyberspace. I’m a long plane ride away from my roots. Flushing into crimson. “Yes,” I sputter. “I am,” I mutter. Being foisted off my shoulders. That's a great new kid poem. It's an awful feeling not knowing where to look. Even as adults it still happens. Looking forward to another great poetry book. You are a master of communicating with children on their level, Amy. That "new kid" feeling rings true even as we become adults who are supposed to better handle such situations. Congrats on your beautiful sheep poem in Manger too!